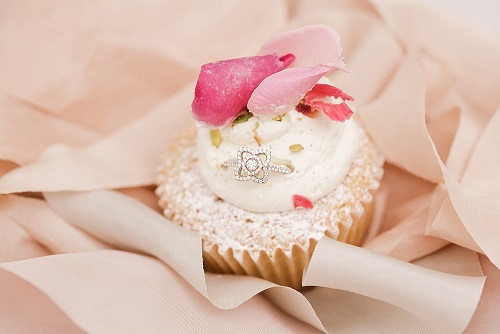 This pastel wedding cake and desserts were created for a wedding and engagement jewellery campaign for De Beers. The elegant cake consists of a double height base and smaller top tier and would make a great addition to a wedding dessert table display or for a smaller celebration. The smaller items were meringues, marshmallows and canape sized cupcakes. All in a pink and peaches theme, delicately decorated with dried rose petals and pistachio. The shoot was styled and photographed by Gooch and Gawler. You can see the full story and campaign on my blog here – De Beers Wedding Inspiration The cake will also be included in the September/October ’15 edition of Brides magazine as part of their Look Book.